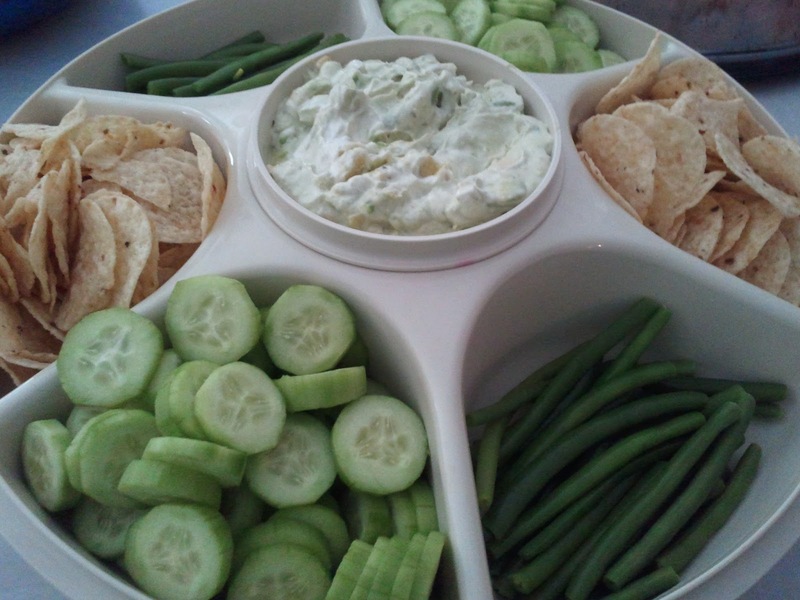 This is an easy to make dip and it is SO flavorful. Nice ripe avocados are a MUST so it does take some planning. I had some ripe avocados and I didn't have the ingredients to make a guacamole, so I whipped this up and I was pleased with it. Cut the avocados and mash with a fork in a bowl. 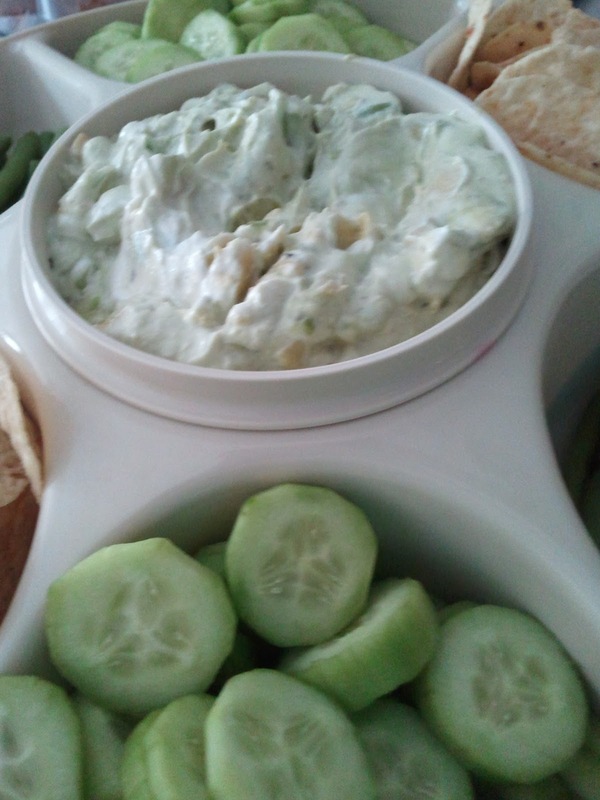 Combine the sour cream with the Ranch Mix, then the Creole Seasoning in another bowl. Fold the avocados in last. Refrigerate for 2 hours and then serve with tortilla chips or veggies. Be sure to buy your avocados a few days before you want to make this dip. You want the avocados to be VERY ripe and creamy. I serve this dip with cucumbers, French green beans or asparagus and bite size tortilla chips. This is my attempt to make Oriental food at home. I really liked the flavor of this dish and it was 6 generous servings. I didn’t add salt or MSG (I think the soy sauce made it salty enough). I got this recipe from Kevin at “Closet Cooking”. Cut all fat, skin, or tendons from the chicken and cut into 1 inch cubes. Add the chicken and sauté until cooked through about 5 – 6 minutes. Mix the peanut butter, soy sauce, lime juice, lime zest, garlic, ginger, brown sugar, chili sauce, and sesame oil in a bowl. Pour the mixture over the chicken and toss to coat. 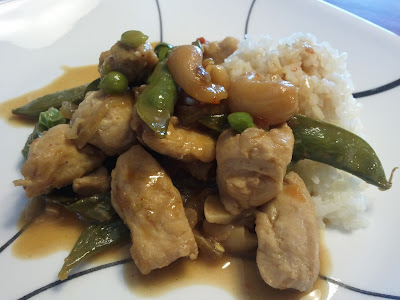 Add the cilantro, cashews, green onions and Sugar Snap Peas and cook for 2 minutes. I used Sambal chili sauce but you can use Chili Garlic Sauce as well. The Sugar Snap Peas and cilantro are not necessary ingredients, but they both give the dish a great flavor. This is my Dad’s recipe. He liked the combination of the citrus and the liquid and powdered crab boil. We like it, too! Place the crawfish in a cooler and fill with fresh water, allow the crawfish to sit in the water for a few minutes while you prepare the boiling pot. Fill the boiling pot with water, half-full. Allow the water to come to a full boil while you squeeze the lemons and oranges into the water. Drop the onions, garlic, liquid crab boil, powdered crab boil, salt, and potatoes into the pot. Drain the water from the cooler, if it is murky; rinse the crawfish again with fresh water. If the water is clear, the crawfish are ready for the pot. 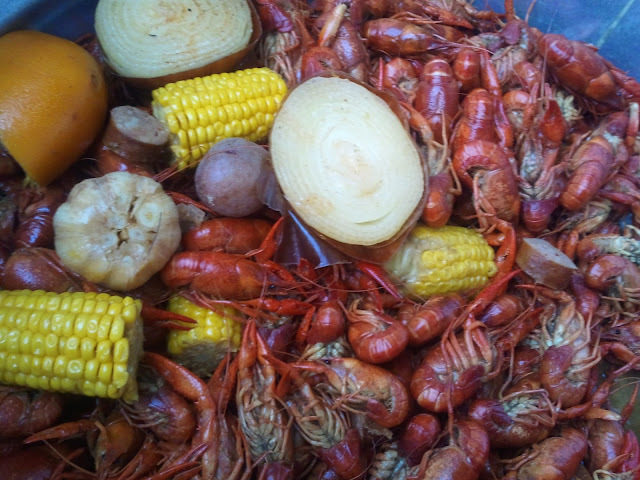 Once the water comes to a boil, allow the potatoes to boil for 15 minutes, and then add the crawfish and the sausage. Allow the water to come back to a boil and then cut the heat. Add the frozen corn, mushrooms and the ice. Put the cover on the pot and allow the crawfish to sit for at least 25 minutes, and then fish a few out of the pot to test their texture and spicy level. If they are difficult to peel, they may need a little more time, if they aren’t spicy enough, you can add some cayenne pepper to the water at this time, maybe ½ C.
Drain the ingredients and serve hot! We use 4 boiling bags: one for the veggies and citrus, one for the potatoes, and one for the sausage, and one for the corn and mushrooms. It makes it easy to pull the bags out of the pot and makes it easy to keep things separated. You will need about 4 lbs. of crawfish per person. If you are boiling more than 30 – 40 lbs. of crawfish, you can use the same water for the second boil. We use the same recipe, but keep in mind the crawfish are usually salter and spicier on round two. This is a great way to serve up some leftover boiled shrimp. It is a Barefoot Contessa recipe. The amount of mayonnaise is adjustable. It should be creamy, but not soupy. 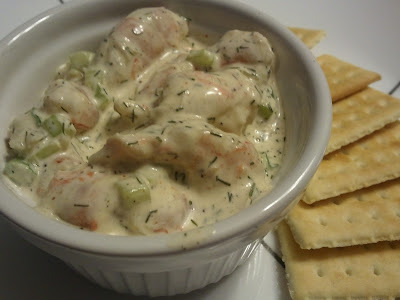 In a medium bowl, combine the shrimp, onions, celery, and dill. In a small bowl, combine all other ingredients until well incorporated. Pour the small bowl into the medium bowl and mix well. Refrigerate for at least 4 hours, but best overnight. Serve over a bed of lettuce or with crackers. I use apple cider vinegar, if I don’t have white wine vinegar or white wine. Sometimes I add 3 or 4 boiled eggs to this recipe, also. I had this soup for the first time at a Saints party. I have been planning to make it for over a year and I finally did. On my first attempt, I used rice noodles not glass or cellophane noodles, well the rice noodles soaked up all of the liquid and I was left with a soggy stew-like paste (very tasty paste, but paste all the same). Round two: glass noodles, and wait till the soup is served to place them in the bowl. Much better! In a Dutch oven over medium heat, sauté the onions and ginger in the vegetable oil until soft about 10 minutes. Add the garlic and the curry paste and cook for one minute. Add the chicken stock, fish sauce, sugar, red bell pepper and sugar snap peas. While the soup simmers, prepare the glass noodles by boiling in water for 4 minutes. Rinse and drain. Reserve. Add the green onions, cilantro, and lime juice to the soup and allow to simmer for an additional 3 minutes. Place the glass noodles in the bottom of the soup bowl and ladle the soup over the noodles. 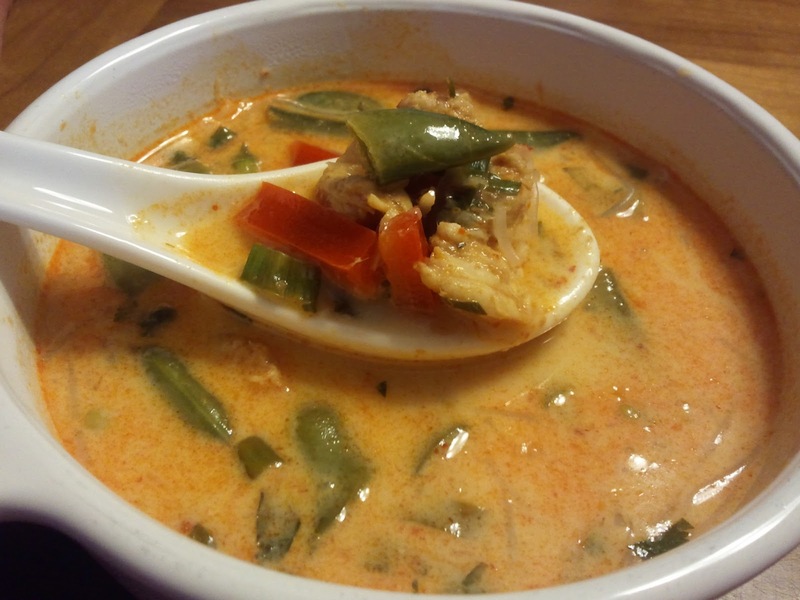 Serve with sambal (chili paste) for those who like extra heat! If you use leftover chicken for this recipe, you’ll need about 2 C. chopped. Just wait and add it when you add the snap peas and bell pepper.